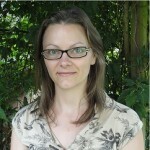 I have written before about acupuncture and depression [link here] and had explained how acupuncture can be used to benefit many aspects of mental health. 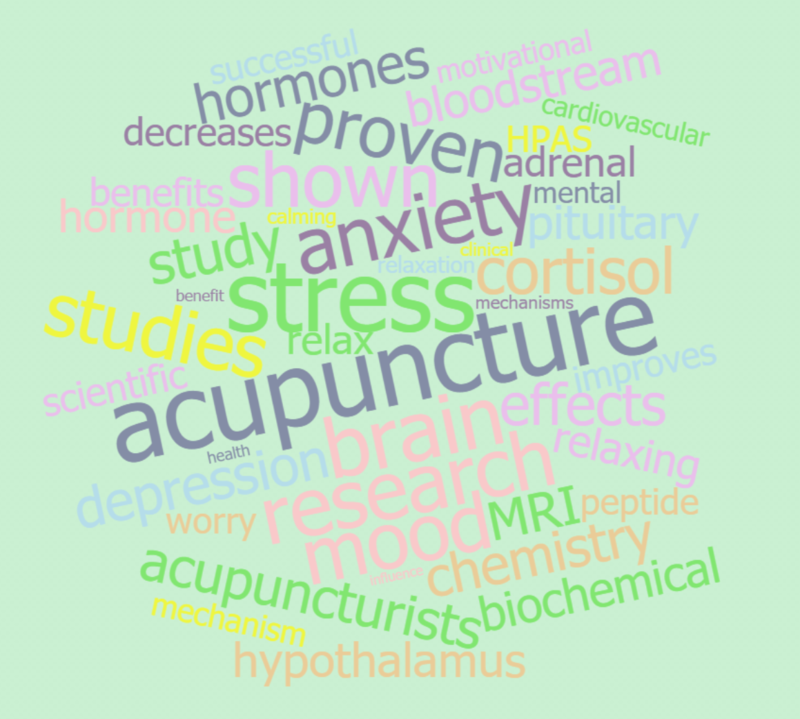 There is a great deal of compelling scientific research to suggest how acupuncture may be helping anxiety and stress; by what mechanism; and this research continues. There have been studies that show the particular mechanisms by which acupuncture is known to lower the stress hormone, cortisol, and also research involving functional MRI brain scans have shown acupuncture can down-regulate the stress areas of the brain. It is also a very relaxing treatment, some patients will even remark makes them feel better the moment the needles are placed. 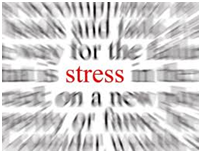 A recent article on a study into acupuncture for stress, and its impact on brain chemistry. It has been found that acupuncture regulates the body’s natural steroid hormones to reduce biochemical reactions to stress. Acupuncture up-regulates certain hormones whilst down-regulating in other areas to maintain balance within the body when it is exposed to stress. Although this seems a complicated process, acupuncture is seen to take abnormal levels and bring them back towards the norm. Research is showing which acupuncture points are better at achieving this effect than others, for example the study mentioned above found that using acupuncture points Liver14 and Bladder23 was more successful than using Spleen6 and Kidney9, for example. This sort of clinical information is one of the benefits of acupuncturists such as ourselves continuing of professional development by keeping up to date and reading the latest research, to improve practice. 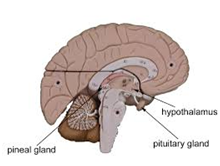 The reasons for particular acupuncture points being better than others for certain conditions as indicated above, are theorised to be due to the ability of particular points in this case influencing the Hypothalamic-Pituitary-Adrenal Axis. The body secretes particular hormones into the bloodstream as a reaction to stress, these are secreted from the hypothalamus, pituitary and adrenal glands, which are also known as the HPA axis, and a peptide (compound) called NPY which is involved in the ‘fight or flight’ stress response. Research has shown that acupuncture can stop both NPY and the HPAS axis hormones from becoming raised in response to stress. This goes some way to explaining that the placebo effect alone is not responsible for the effects, as there is proven specificity of certain points in have a very specific influence on the HPA axis for stress, where other points simply do not. Acupuncture can also have calming effects due to its effect on the cardiovascular (heart and circulation) system. For example, research has shown that acupuncture point PC6 decreases heart rate and improves heart rate variability. Acupuncture is also known to relax the blood vessels and lower blood pressure. MRI studies also show the very specific effects of acupuncture on the brain, specifically toning down the activity of the parts of the brain responsible for pain, stress, anxiety and worry. If you’re keen to read more and see the primary research, I also curate several web pages gathering research, news and information from journals, so you could start here: Acupuncture for anxiety and depression and also check out the references and useful links below. Don’t forget, we are always happy to talk to you about what we do, and to answer your questions. By phone, email or in person, you can book a call-back or free 20 minute consultation to find out us and our clinic, and whether acupuncture is for you. Liu, RP; J. L. Fang, P. J. Rong, Y. Zhao, H . Meng, H. Ben, L. Li, Z. X. Huang, X. Li, Y. G. Ma, B. Zhu, Effects of electroacupuncture at auricular concha region on the depressive status of unpredictable chronic mild stress rat models. Evidence-Based Complementary and Alternative Medicine. 2013;789674.